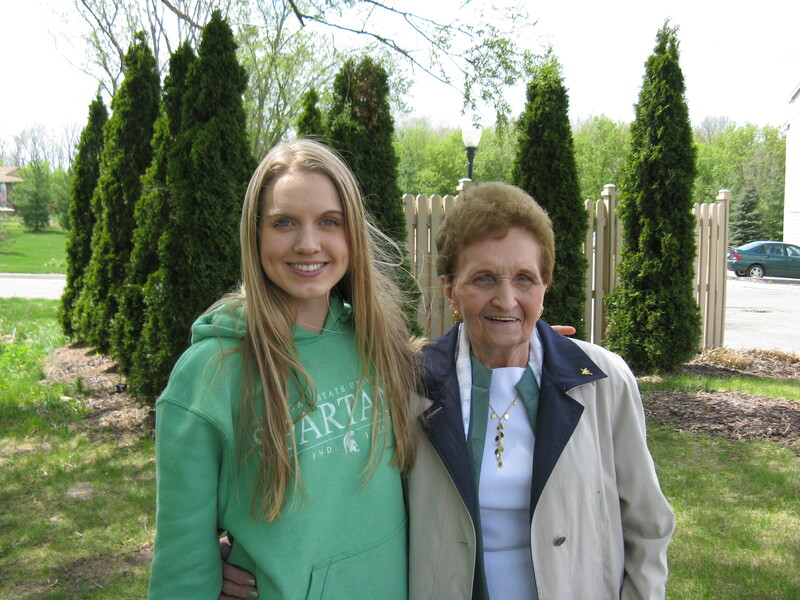 Grandma Reilly and me back in May 2008, the day after I graduated from college. My grandma has been on my mind a lot lately, even more so since arriving back to my hometown in Michigan. She passed away in early May of this year and it’s been hard for all of my family to cope with. She played a significant part in all of our lives and had so much love and appreciation for us, as did we for her. She endured a lot of tragedy in her life, starting at a very young age, but never let it stop her from living a fulfilling life. Any one of her experiences would have been enough to put a person over the edge or remain a pessimist, but grandma trekked on, held her head high and moved forward with her life. She is hands down the strongest woman I have ever known. She was stubborn, open-minded, strong, beautiful, put-together, loving, funny and determined. I am proud to have her as my grandma and grateful for the 27 wonderful years we shared together. Today, my mom and I took a drive over to my grandma’s house and spent about two hours browsing around the house and looking at her things. We pulled out and admired her gorgeous ice blue, satin and lace wedding dress (from 1953), opened drawers and cupboards, looked through her many pairs of earrings, smelled her perfumes (at least I did) and so on and so forth. It was sad and strange to go to her house and not have her there, especially when all of her things are in place and everything looks and smells the same. My mom mentioned that grandma had some bags of Michigan apples in her freezer that she sliced last fall and suggested bringing home one of the bags and making some sort of apple crumble with it. I thought it sounded like a good idea, so mom put me in charge of coming up with a recipe. We both knew grandma would be happy to see us preparing and eating the apples that she took the time to slice and store. There’s lots of love in each and every slice. The filling — grandma’s apples, spices, honey and butter. 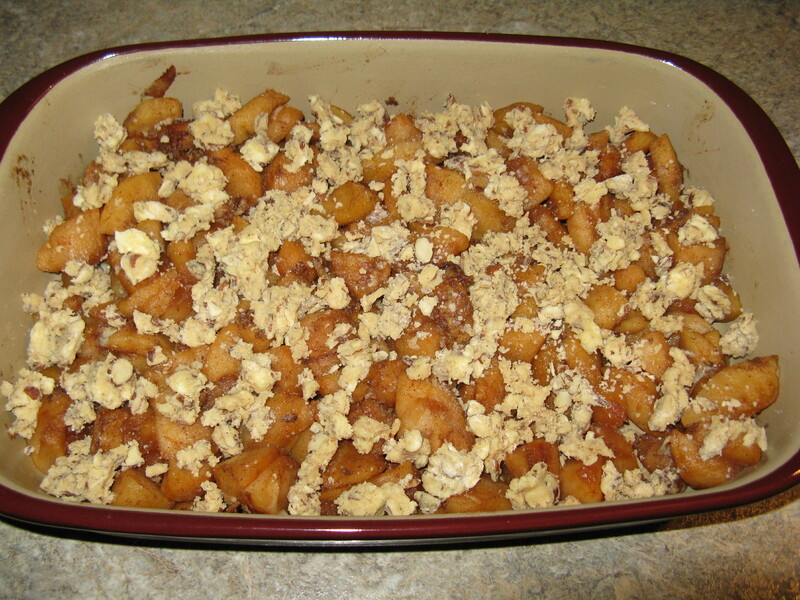 Filling with crumble topping, before going into the oven. Mix all filling ingredients together in a bowl and pour into a greased 9×13 or 9×9 baking dish. 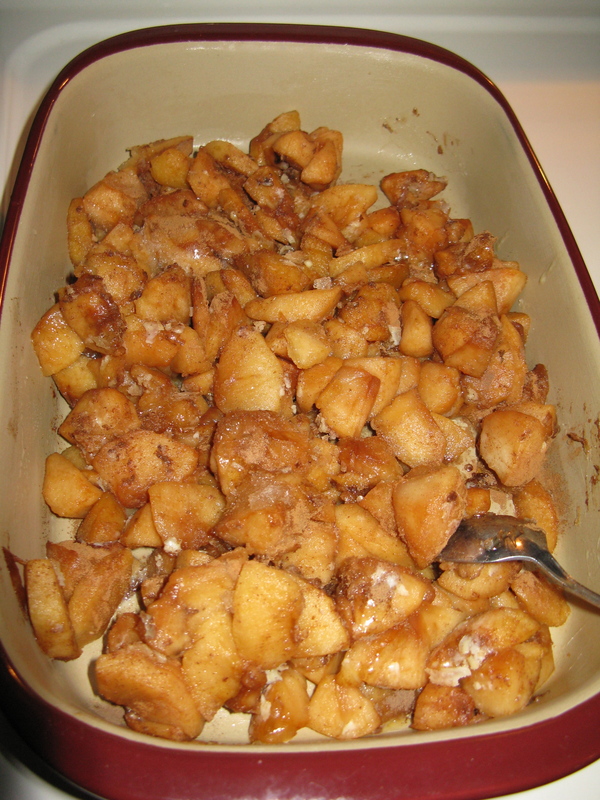 Mix topping together and then cut in cubes of butter until everything is crumbly. With your fingers, spread the topping over the apples. Bake in preheated oven for 20-30 minutes or until topping is golden brown. *Note: mine baked for about 37 minutes because the apples were still partially frozen. Apple crumble, fresh out of the oven. These apples were delicious, well-spiced, tender and tasted like fall. I ate mine with coconut butter drizzled on top, but my mom and sister ate theirs with Greek yogurt and homemade granola. A drizzle of coconut milk would be tasty too. Most importantly, the representation of the apples and eating something my late grandma prepared was extremely meaningful and comforting. 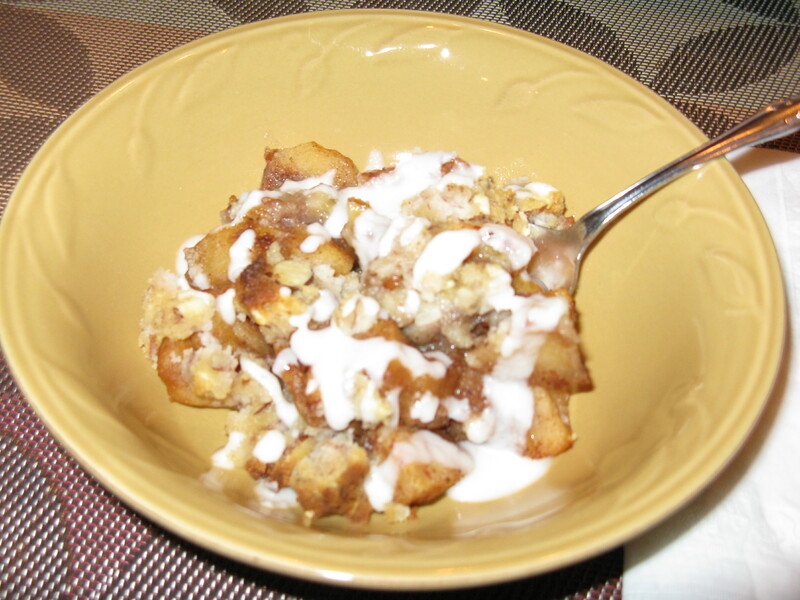 My bowl of apple crumble with coconut butter drizzle. Okay. I can’t believe it, but I just ran out of coconut flour!! I need some more asap. My husband would love this. Better make an emergency run to the grocery store!! You could try it with almond flour if you have that instead. I’d love some of that with a cup of tea right now! It’s delicious and would definitely pair nicely with a cup of herbal tea!